The band saw is a useful cutting tool, which you can use to cut wood, glass, metal and other materials. The band saw uses very sharp and powerful blades to cut the subjected materials. Many accidents occurred across the world in which people have lost their body part, got injured, become blind and some had also lost their lives. So, it is quite necessary to take complete safety when using a band saw otherwise there can be some really drastic situation for you. Follow below given band saw safety tips to avoid all sorts’ injuries and accidents and complete your job safely. There is no need to talk, dance or sing, when you are using the band saw. Many people have got injured just because they were not focusing on their job and doing other things during the cutting work. You should be completely focused on your work, when using a band saw because any negligence can be life threatening for you. Keep your hands at a safe distance from the saw blades and cut the objects carefully. It is important to be active and alert on the job site. Band saw blades can easily cut your body parts, if came in contact with the saw. 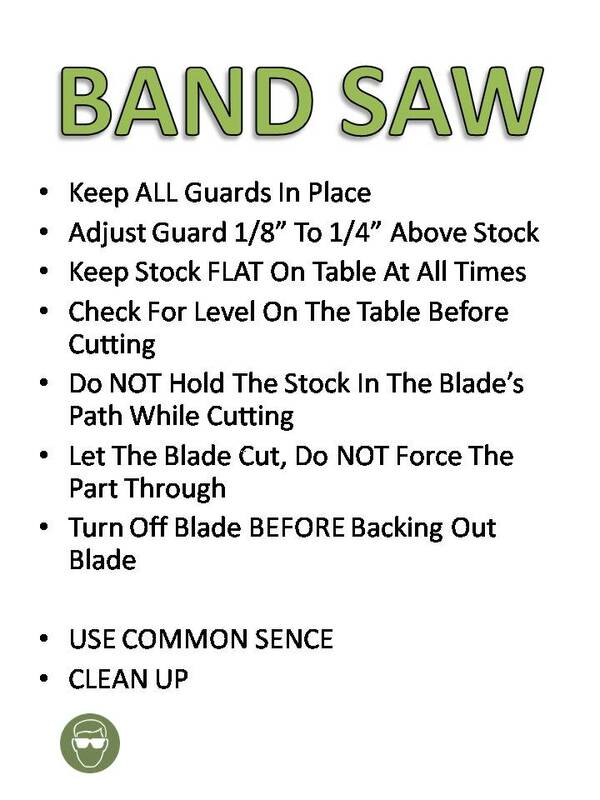 One of the most important band saw safety rules is “Never remove any guard from the machine”. The designers have installed guards on the right position to prevent the user from any kind of physical damage. Suppose, you are cutting hardwood and pushing it towards the band saw blades. Now, if your hands slip, the guard will prevent it from getting injured. The chances of injury would be higher, if there is no guard. The guards are also useful for maintaining the stability of the band saw blades. So, never remove the guards and keep them on their position to maintain good safety. Do you have a habit of keeping band saw on and doing other works, while it is on? This habit can cause a serious damage to you, your family members or other workers on the job site. Turning on or turning off the band saw machine is a very simple task. You should turn it off immediately after completing the cutting work. Anyone can walk around it and accidentally fall over the rotating blade of the band saw. Be careful and keep it off, when you are not using it. Experts always suggest that the user should position his hands away from the blades. Some users hold the cutting material quite tightly and take their hands closer to the band saw blades for cutting the objects accurately. Of course, accuracy is important, but your life is more important. So, position your hands at a safe distance from the blades and then use the band saw machine. 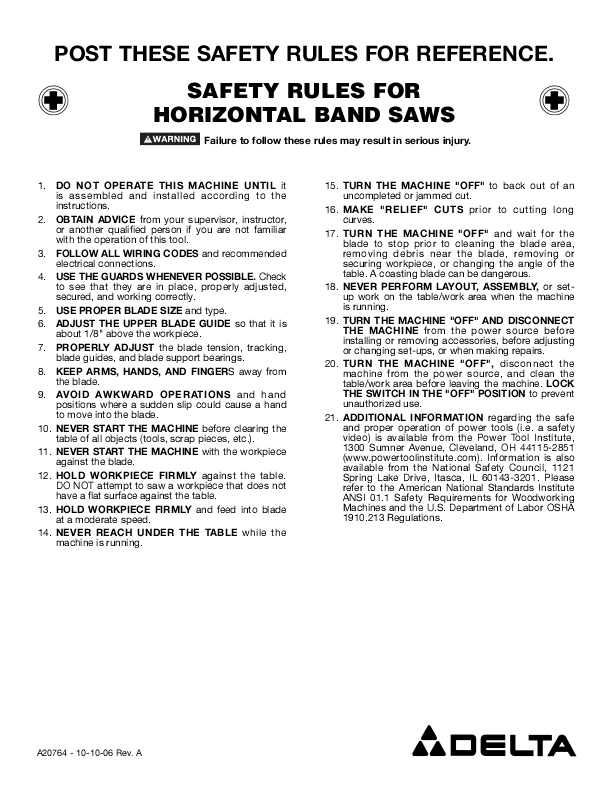 Follow above given band saw safety tips to avoid the injuries and other issues. You can perform a much better job, if you are safe and healthy.